As one of live looping’s freshest innovators, San Francisco’s own The Genie creates spellbinding, futuristic electronica that is a remarkably seamless blend of diverse genres and avant-garde, guitar-based instrumentation. Known for taking “a DJ approach to guitar,” he developed a highly original live remixing technique called “g-mixing,” and a unique brand of live looping he calls “scratch guitar,” which utilizes the same method a scratch turntablist might use, only on his electric guitar, played horizontally with a slide and ample pedal manipulation. (The term also reflects that he makes his music in the moment, “from scratch.”) Citing influences as diverse as DJ Shadow, Sun Ra, Stanley Jordan, Portishead, Ernest Ranglin, and Radiohead, the Genie’s music spans hip-hop to ambient, EDM to psychedelic, with a little dub thrown in for good measure. It’s a mesmerizing mix of live electronica and “analog Djing,” as he puts it – some designed for lounging, and some indisputably made to make the body groove. His third and latest release, Crystal Mirror, Pt. 1, is a sonic odyssey to the cosmos and back. Laden with an exotic blend of eclectic instrumentation, the album flirts with different genres while resisting labels and easy categorization. The Genie integrates dub elements without sounding sparse; sitar without sounding like world fusion and fuzzy, distorted guitar without sounding like rock. Instead, his distinct genre-blending, honed over sixteen years of playing live, creates a sound all his own – something cosmic and unpretentious, far beyond limiting, Earth-bound classifications. Look deep into this Crystal Mirror and you’ll see something totally unique and easily relatable. It is bass-heavy without sacrificing melody or composition, and it combines instruments from all over the world to make a sound that is, paradoxically, out of this world. Listening to Crystal Mirror feels like riding through space on a shooting star that leaves glitter in its wake. The opening track, “Camera,” consists of a slightly dubby bassline laid over classic down-tempo beats with some reminiscence to UK’s DJ Skream, with strings and an expansive blend of classical, Spanish, and steel guitar styles making appearances throughout. And despite multiple guitar tracks layered over the song, they come in at different points so all the sounds have room to breathe. The Genie is skilled at creating sounds that draw from multiple genres while still staying true to his vision – his hip-hop sounds like hip-hop, only more involved and more evolved – as heard on “Generators,” a hip-hop leaning track that uses guitar as a lead instrument without sounding like a lazy mash-up. And his EDM sounds like EDM, despite comprising a plethora of other influences and chord progressions not usually found in EDM, as in the case of “Tension,” a drum-and-bass-influenced stand-out on the album. Other gems include “Warrior Dance” and “Bottom of the Sea,” which sounds like something you’d hear pouring out of Ibiza’s swankiest lounges at sunset. For an instrumental album, Crystal Mirror brims with surprising depth. This is not just a DJ laying down a beat that stays the same throughout the song and then throwing random sounds all over it. The songs on Crystal Mirror are actual compositions, complete with dreamily unexpected chord changes and delicately ethereal bridges, that one could easily expect would be played by a full band. And it actually sounds like it is being played by a full band, even live, as he maximizes his extremities to handle an extravagant array of sonic responsibilities. Utilizing a highly innovative version of live looping which turns his loop pedal into an instrument in itself, the Genie’s style is next-level and totally unmatched. When he opened for Shabazz Palaces at The Chapel in San Francisco during the Noise Pop festival in February, he was a multitasker extraordinaire, sliding through guitar riffs, playing keyboards and a synthesizer, tending to his effects processor and three Line6 DL-4 loop pedals, and turning knobs, flipping switches and manipulating a host of gadgets with his toes. And the self-taught guitarist moves through his instruments with such deft fluidity and ease that it almost looks easy. Almost. He is extraordinarily intriguing to watch, and San Francisco will have a chance to do just that on Friday, August 17, at the Crystal Mirror album release party with Izzy Wise at Bar Flux beginning at 8pm. Expect his aesthetics to coordinate perfectly with the album – for the Genie, the Crystal Mirror is a lifestyle. His studio, Crystal Mirror Space, which he describes as “a visually immersive watery-world-themed Mylar chamber bursting with color and light,” is open for tours and is decked out top-to-bottom in reflective, mirrored Mylar and lit up with lasers, LED lights, and H20-projectors that create a stunning visual experience in San Francisco’s Outer Sunset. 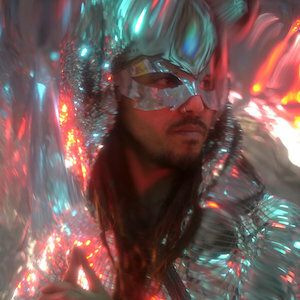 He even dresses the part in his self-designed Crystal Mirror “space suit” – an entirely mirrored reflection of sparkling light. This one-man band also does his own lighting using a custom, portable LED-light stage with a Mylar backdrop. 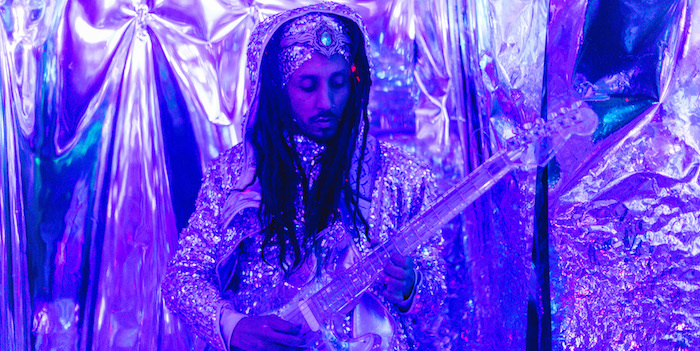 And his highly customized, transparent guitar, known as Blue Dream (named for a Joe Satriani album, not the cannabis strain), has built-in blue LED lights and refracts light the way his unparalleled looping style refracts sound. So Friday’s sonic bliss-out will also be a feast for the eyes, and well worth checking out. Find out more about The Genie on his website.